If tourism is to contribute to achieving goal 2 “End hunger” it is important to ‘think local’ – not only serving the interests of tourists, but of the local people. An integrated holistic food-based approach to tourism enables local farmers to grow nutritional food using responsible agricultural practices allowing them not only to feed their families but also to earn an income by selling produce to tourism enterprises. While a few progressive and mindful travelers increasingly demand locally grown, traditional food, the rise of fast food chains has commercialized food production and changed local lifestyles in many parts of the world. Furthermore, food waste in tourism is a serious concern to the achievement of goal 2. Understanding the linkages between Goal 2 and tourism requires reflections on issues that relate to food security, nutrition and sustainable agriculture. The actions of every individual on the planet reflect the state of being, the common core values of a community. The African philosophy Ubuntu “I am because we are” is like the umbilical cord of people wanting to connect to other people. The choices one makes and the mindful encounters in the way people travel make a big impact. Travel and food means people and land. The way people eat reflects a way of life that translates to systems of economy and food production. Stakeholders in tourism need to understand the core values of people and agriculture to address issues related to food which are felt by the people in travel destinations. Food is a major part of the tourism experience. The World Food Tourism Association notes that “only 8.1 percent of all foodies self-identify with the “gourmet” label” (Petrak and Beckmann, 2015). Often the most interesting culinary experiences come from a variety of social and economic backgrounds. Culinary tourism is especially appealing in rural areas. These areas are close to food sources and often have preserved local traditions. Rural food tourism locations that are most successful have found ways to protect their food ecology and offer interesting meals at reasonable prices. Tourism can play a role in increasing the demand for traditional food. A story featured in Green Destinations cited best practices in Europe which put Ljubljana on the world map. Ljubljana became a brand with a strong following for gastronomic tourism that awakened the pride of the local people and its local authentic cuisine. A new product created a movement that generated local pride and identity with responsible practice. Tourism as a prime economic-generating activity has a trade off. Mass tourism practice entails losses in the name of profit. While people earn from tourism, it has also affected the preoccupation they played in the community as providers and role models. In many cases, fishermen who used to catch fish to support the whole community decided to become tour guides or taxi drivers. As a consequence, the community lost food providers who chose to get paid for their tourist services instead. Instead of producing their own food, communities have to obtain food from other sources. Another critical issue is the displacement of indigenous communities in favour of business establishments, which has reduced or curtailed people’s access to land to grow their own food. In the Philippines, many areas of Mindanao used to be sacred ancestral land of the indigenous communities. Through the years, Lake Sebu, home to T’boli people known as the Dreamweavers of T’nalak, became a classic example of displacement. The sacred lake was turned into a commercial area with resorts, mostly owned by migrants and foreign investors. The local indigenous people were reduced to landless resort workers or entertainers. Local farmers lost their ancestral land which they had used for food production. This changed the whole lifestyle and community dynamics. They lost control over their own food production and sovereignty over their land. The strong communal system of sustainable food production has been defeated by self-serving private businesses at the expense of the indigenous community’s self determination and preservation. Another downside of tourism is the commercialization of places, with associated rises in prices. Tourism has led to businesses dictating the prices of local food and fish catch. In many islands where there is an influx of tourists, local people can no longer enjoy local prices. Small islands often experience shortages of locally produced food. The most common strategy is to import food from different sources, from other islands or from abroad, which costs more with the mark up on freight, transportation and labour. According to the USDA-Foreign Agricultural Service, the Caribbean Basin is the 7th largest export market for U.S. consumer-oriented foods. Being small islands with importation dependency on the USA means a very expensive lifestyle in the islands, only intended for rich tourists. The rise of fast food chains has commercialized food production and changed local lifestyles in many parts of the world. Farm to kitchen produce by local farmers has regained a new following among the progressive and mindful few. The trend of going back to organic and chemical free dining has a sensitive touch of consciousness, but only a few adhere to strict principles of using local produce. Tourism does not necessarily benefit directly the poor farmers who produce food for tourists. Food often served in restaurants features the chef and the branding, but often fails to make the local producers visible. Farmers may produce the best coffee in the world, but may remain in poverty, marginalized in their direct participation and share of profit. In the Philippines, the Banawe Rice Terraces, declared World Heritage Site by UNESCO in 1995, which made the Ifugaos proud of their ancestors for hundreds of years, is short of rice to supply its own community. Agriculture is dying. While tourists visit the site to see the world famous rice terraces, the irony is that in the new generation it is hard to find young people who want to become farmers and plant rice and vegetables. 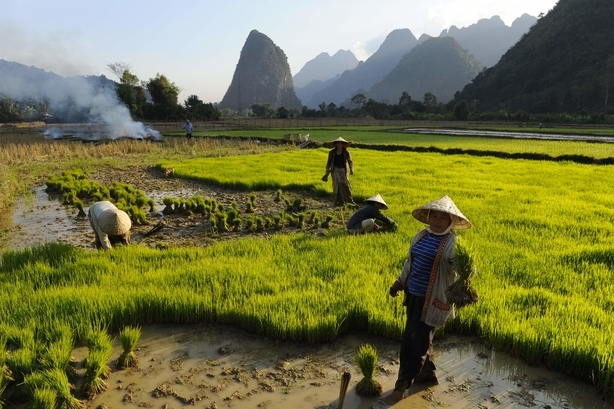 Other rice farmers prefer to sell their organic mountain rice at a good price than to use it for personal consumption. Food is imported and some locals become dependent on noodles or canned goods. The hauling of commercial products costs a lot due to transport, fuel and commercial value. Local farmers cannot compete with imported products such as rice. It is ironic that a rice producing country like Philippines is currently importing rice. While as a country, it has one of the biggest productions of food for export, while a large number of its children are malnourished. More than eight million New York City residents and at times over 500,000 tourists per day with an average personal waste of seven kilos per person, with three meals a day, is unsustainable. The problem of food waste seems unstoppable. According to Steve Cohen of Earth Institute 2016, over 25,000 tons of garbage is collected each day. The influx of tourist adds to the daily consumption of food and water. In addition, the food industry requires fuel and other resources that add to the statistics of consumption and waste. Travelers are looking for something new, something to eat that they do not eat at home. The fast food experience is slowly becoming unpopular and has many problems such as excessive waste. There are new ‘foodways’ experiences which combine art, conversations, interactions and food culture with local meets local, and local meets the world. ‘Spatula&Barcode’ makes art projects in which the performance of place and of hospitality are central aesthetic concerns. While most ‘Spatula&Barcode’ projects involve food in some way, their recent series ‘Foodways’ specifically explores the movements of food and food culture. It is important to ‘think local’ – not only serving the interests of tourists, but of the local people, making prices affordable to the local people. The kind of tourism which promotes local food supported by local community has now expanded in malls with a resto-spa and souvenir shops. An integrated holistic food-based tourism means people and health, while providing food on the farmer’s table with proper nutrition and responsible practices in agriculture (> Goal 3). More than international tourism, domestic tourism brought a change in the economics of food in the Philippines, as Filipinos love to bring food home as ‘pasalubong’ or gifts. This helps in the local economy, as domestic tourists buy to share the products of a place. Artisanal food products such as coffee, chocolate and tea also find a new market. Local government units also promote ‘one town one product’ to help local communities develop their creative enterprises. Successful food tourism aroused the interest of domestic tourists with the new trend of artisanal home-made products in a farm resort, or agri-tourism as a tourism package. One of the trendy tours that have existed for many years is cultural tourism which includes food tasting of different local delicacies and the actual visit to a local home or backyard food production site and workshop. The trend in travel as a lifestyle needs to influence the global mentality of providing food on the table, but mindful of the source and responsible farming practices. Travellers may produce viral blogs on organic practices, not only concerning practical information, but also real stories of people in local communities that can teach other communities. People travel, and so stories can travel with them and start connecting the dots. One of the biggest networks of travelling people which concerns food is the World Wide Opportunities on Organic Farms (WWOOF) which is a loose network of people from all over the world that facilitates placement of volunteers on organic farms. The travellers mostly donate or contribute a minimal amount, but mostly work on the host farms to pay for their food and accommodation. One of the ways in which to know a country and its culture is to live with a local family while sharing the philosophy and principles of organic farming. The travellers spread the experience to other farms as they travel the world. Some people stay for a couple days, while others may end up staying for months. They are part of a conscious community of doers willing to help communities plant their own food.